Born in Berlin in 1903, Jaffe studied psychology at the University of Freiburg. When Hitler came to power, she moved to Zurich where she met Jung in 1935. She attended seminars and analyzed with Jung for many years, becoming his secretary in 1955. She collaborated with him on Memories, Dreams, Reflections, and with Gerhard Adler on the two volumes of Jung’s Letters. Other books by her include C.G. Jung: Word and Image (ed. ); The Myth of Meaning; and Jung’s Last Years. Born in Berlin in 1903, Jaffe studied psychology at the University of Freiburg. When Hitler came to power, she moved to Zurich where she met Jung in 1935. She attended seminars and analyzed with Jung for many years, becoming his secretary in 1955. She collaborated with him on Memories, Dreams, Reflections, and with Gerhard Adler on the two volumes of Jung’s Letters. Other books by her include C.G. Jung: Word and Image (ed. ); The Myth of Meaning; and Jung’s Last Years. Here she discusses the therapeutic value of the positive transference in analysis; the uniqueness of individual personality; the need for openness to new developments in depth psychology; the psyche as a foundation for authentic spiritual experience and maturation; and Jung’s personal attributes, including his temper. Frau Jaffe died in Zurich in October, 1991. 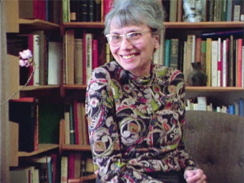 This conversation with Suzanne Wagner, Ph.D., a Jungian analyst practicing in Sausalito, California, was filmed in Zurich in March of 1977. Producer: George Wagner – Director: Suzanne Wagner, Ph.D. – Editor/Line Producer: Tee Bosustow – Music: John Adams.